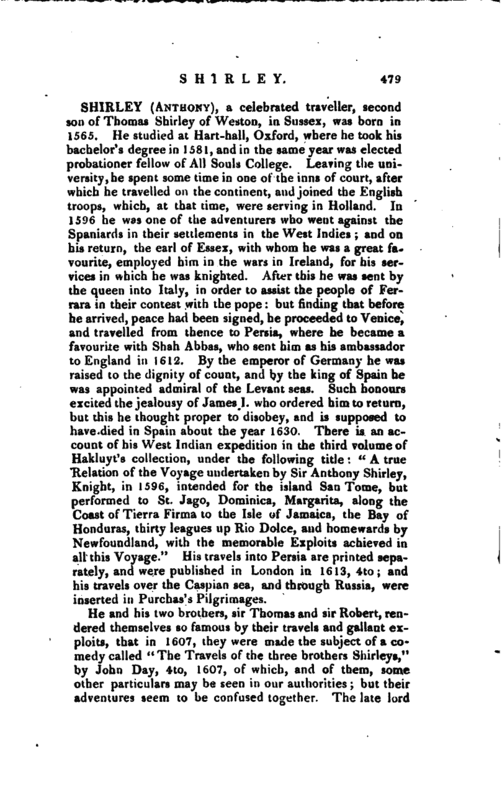 , a celebrated traveller, second son of Thomas Shirley of Weston, in Sussex, was born in 1565. He studied at Hart-hall, Oxford, where he took his bachelor’s decree in 1581, and in the same year was elected probationer fellow of All Souls College. Leaving the university, he spent some time in one of tru 1 inns of court, after which he travelled on the continent, and joined the English troops, which, at that time, were serving in Holland. In 1596 he was one of the adventurers who went against the Spaniards in their settlements in the West Indies; and on his return, the earl of Essex, with whom he was a great favourite, employed him in the wars in Ireland, for his services in which he was knighted. After this he was sent by the queen into Italy, in order to assist the people of Ferrara in their contest with the pope: but finding that before he arrived, peace had been, signed, he proceeded to Venice, and travelled from thence to Persia, where he became a favourite with Shah Abbas, who sent him as his ambassador to England in 1612. By the 'emperor of Germany he was raised to the dignity of count, and by the king of Spain he was appointed admiral of the Levant seas. Such honours excited the jealousy of James I. who ordered him to return, but this he thought proper to disobey, and is supposed to have died in Spain about the year 1630. There is an account of his West Indian expedition in the third volume of Hakluyt’s collection, under the following title: “A true Relation of the Voyage undertaken by Sir Anthony Shirley, Knight, in 1596, intended for the island San Tome, but performed to St. Jago, Dominica, Margarita, along the Coast of Tien a Firma to the Isle of Jamaica, the Bay of Honduras, thirty leagues up Rio Dolce, and homewards by Newfoundland, with the memorable Exploits achieved in all this Voyage.” His travels into Persia are printed separately, and were published in London in 1613, 4to; and his travels over the Caspian sea, and through Russia, were inserted in Purchas’s Pilgrimages. Ath. Oxon. vol. I. Dodd’s Church History, vols. II. and III. Fuller’s Worthies. 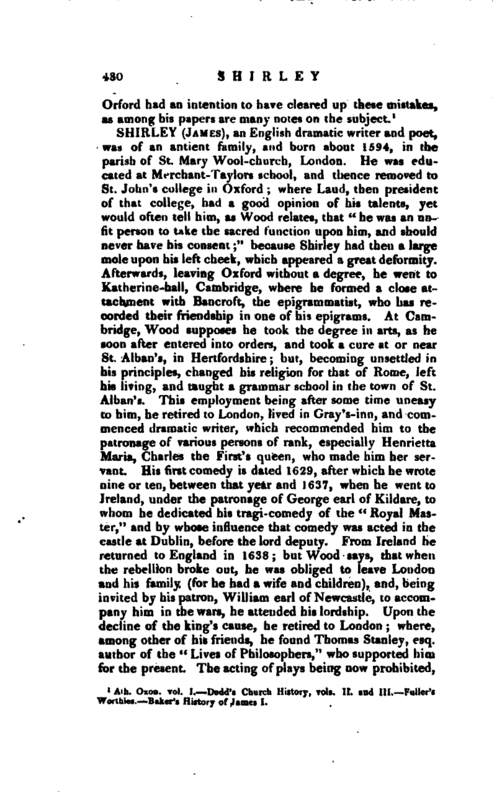 Baker’s History of James I.